Would you like...no! You want to kick Kim out! Just use the mouse and kick him out as far as you can. Get some points and you will upgrade your power. Just try to do everything right and you will love this game! Vanquish it! Ready to kick him out?! Then go ahead! So, are you sick of Kim Jong nuclear tests? 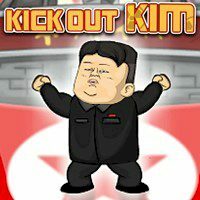 Then take an extra ordinary chance to Kick Out Kim! You will take a big swing with your laptop to toss the weird ruler of North Korea as far away as you can. By the way, along the way you can use upgrades and special boosters to make his flight even more funnier. It is so easy to control, just use the mouse to launch Kim, once he is moving, you can also start throwing grenades, shooting and using lots of different boosters against him, all controlled with the mouse. Have fun!